After completing the initial tutorial you will begin the actual game. 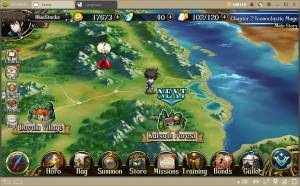 At the start the whole game will not be accessible and you will need to invest a few hours completing chapters and reaching levels before all the features become available. Listed below is a list of what you can expect to unlock and at what stage of the game it will likely happen. Note: Some features will become available based on your team/account level while others will depend on your progress through story mode so it is advised that you keep things moving with the narrative chapters.